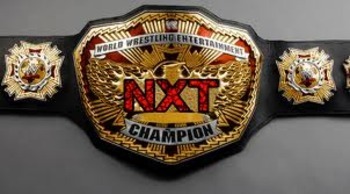 1 Seth Rollins 1 July 26, 2012 133 WWE NXT Defeated Jinder Mahal in the finals of an eight–man tournament to become the inaugural champion. Aired on tape delay on August 29, 2012. 2 Big E Langston 1 December 6, 2012 168 WWE NXT This was a no-disqualification match. Aired on tape delay on January 9, 2013. 3 Bo Dallas 1 May 23, 2013 280 WWE NXT Aired on tape delay on June 12, 2013. 4 Adrian Nevelle 1 February 27, 2014 287 NXT Arrival This was a ladder match. 5 Sami Zayn 1 December 11, 2014 62 NXT Takeover: R Evolution This was a title vs. career match. If Sami Zayn lost, he would voluntarily quit the NXT roster. 6 Kevin Owens 1 February 11, 2015 143 NXT TakeOver: Rival Owens defeated Zayn when the referee decided that Zayn was unable to continue. This was the first time ever that the championship has changed hands outside of North America and outside of Full Sail University. 8 Samoa Joe 1 April 21, 2016 121 Lowell, Massachusetts Live event WWE recognizes Joe's reign as lasting 122 days. 9 Shinsuke Nakamura 1 August 20, 2016 91 Brooklyn, New York NXT TakeOver: Brooklyn II WWE recognizes Nakamura's reign as lasting 92 days. 11 Shinsuke Nakamura 2 December 3, 2016 56 Osaka, Japan NXT An edited version of this match aired on the December 7, 2016, episode. The full match aired on the December 28, 2016, episode.WWE recognizes Nakamura's reign as lasting 57 days. 13 Drew McIntyre 1 August 19, 2017 91 Brooklyn, New York NXT TakeOver: Brooklyn III The title became recognized as a world championship. WWE recognizes McIntyre's reign as lasting 92 days.